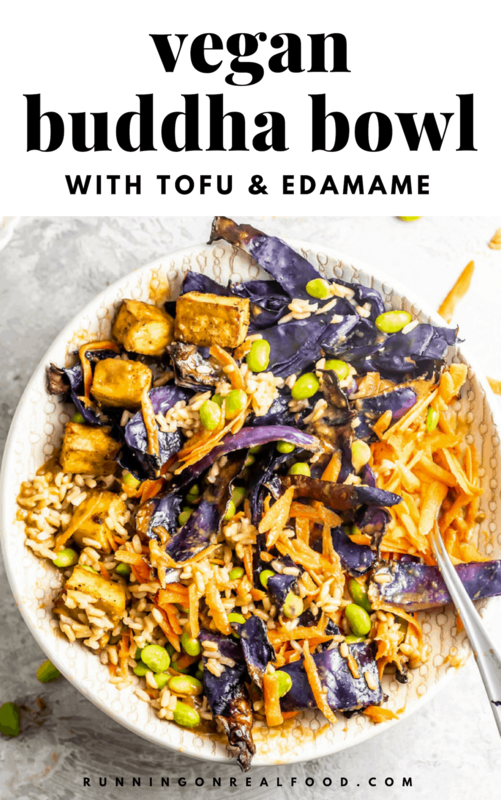 This Vegan Buddha Bowl with tofu and edamame features with brown rice, roasted red cabbage and grated carrot and is high in protein, full of flavor and works well for meal prep. This recipe can be oil-free and gluten-free if needed. I’ve used this sauce in a number of recipes before. It’s my favorite almond butter satay sauce made from light coconut milk, almond butter, sweet chili sauce and soy sauce and it’s so easy to make. I love it because it tastes great, works with lots of different dishes and doesn’t require any blending. Simply mix the ingredients together in a container and it’s ready to go. I’ve even made it with cashew milk and almond milk instead of coconut milk and it still tastes great. I also used it on my brown rice tofu bowls with coconut bacon and easy vegan spaghetti squash noodles. This high-protein dish is a good choice for vegan meal prep since everything can be made ahead of time. 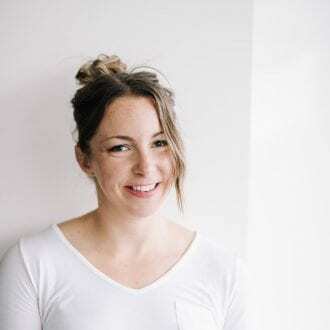 You can prep individual servings ready to grab-and-go but if possible, I’d suggest storing the ingredients separately until the day you plan to eat them. If you can store all that separately for easy assembly during the week, that’s the way to go. If you plan to have it for lunch the next day, assemble a serving the night before or the morning of. 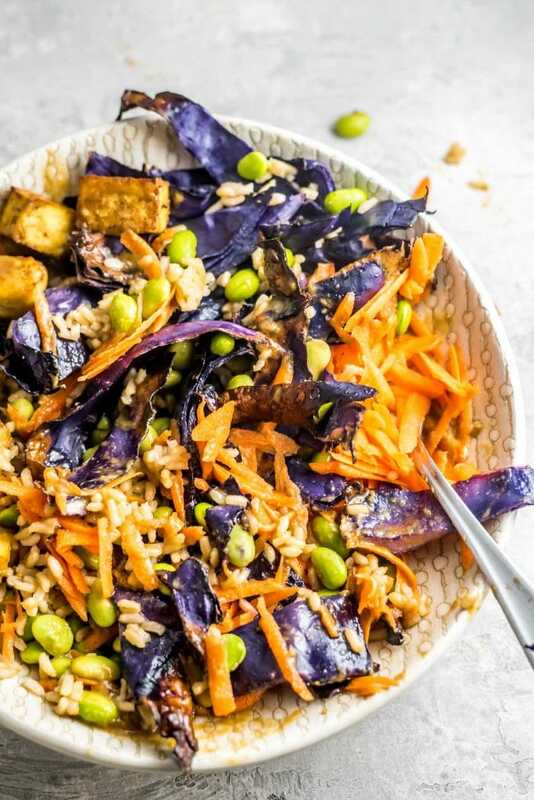 By prepping these ingredients ahead of time, you can quickly throw together healthy buddha bowls like my Mediterranean farro bowls or teriyaki quinoa bowls. 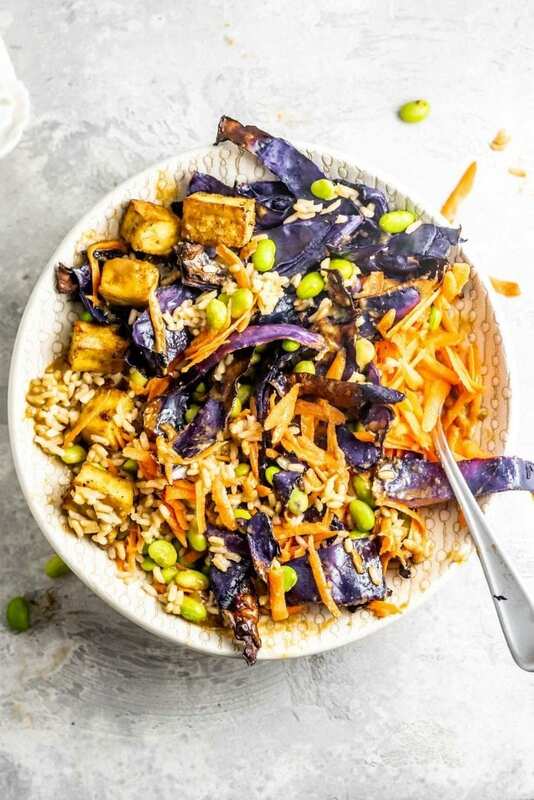 Buddha bowls seem like they have a lot of ingredients but they’re actually very easy to make if you do a bit of prep. For more meal prep ideas, check out my weekly prep posts. There are two ways I love to cook cabbage: sauteing and roasting. For this recipe, I wanted to keep the method as simple as possible so I went with roasting. This way, you can have it cooking in the oven at the same time as the tofu. To roast cabbage, pre-heat the oven to 400 degrees, chop and sprinkle with a pinch of salt and pepper then spread on a baking tray and roast until starting to brown. It’s really good roasted in big slabs but for this recipe, since it’s getting mixed into a bowl, I went with slices. You can make it with or without a bit of olive oil, both are good. To saute cabbage, I cook it in a pan with water, allowing the pan to dry out then adding a splash more water and repeating until the cabbage is caramelized. It’s so good! I make cabbage often like this for a snack. Bonus: if you go for red cabbage because which is full of anthocyanins, a type of antioxidant found in blue, purple, and red plants. 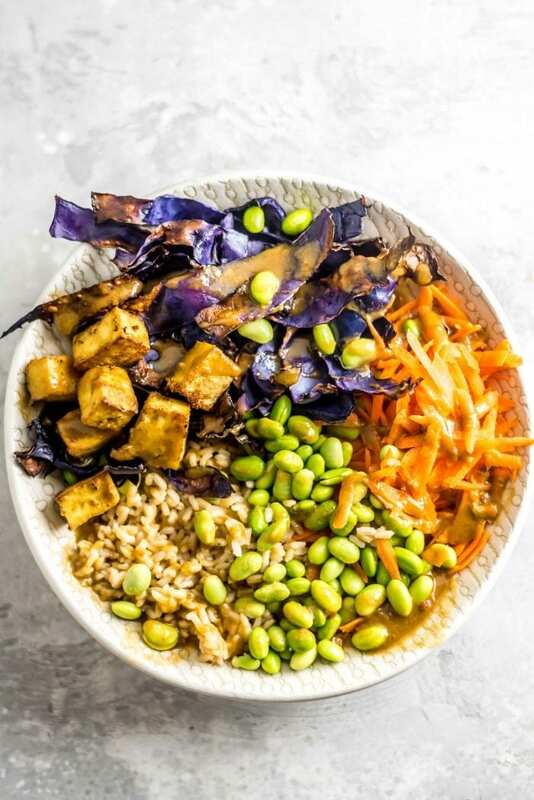 Alright, here’s what we’ve got going on in these yummy Asian-inspired vegan buddha bowls: shelled edamame, brown rice, baked tofu, roasted red cabbage, raw grated carrot and creamy, slightly sweet, coconut almond satay sauce. They’re high in protein, high in fiber, full of flavor and texture and make a filling, healthy plant-based dinner. 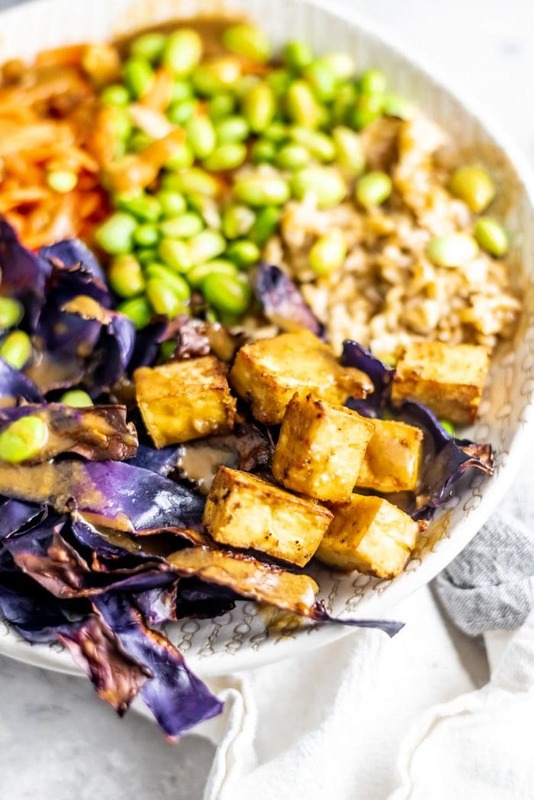 These yummy, healthy, high-protein buddha bowls loaded with flavor and texture and full of nutrition. To make the tofu, cube and toss with the soy sauce, black pepper and garlic powder. Prepare a baking sheet by either lining it with parchment paper or a silicone baking mat or using some non-stick cooking spray (I like this avocado oil spray). Place the cubed tofu on the tray and bake for 30 minutes, flipping once halfway through. 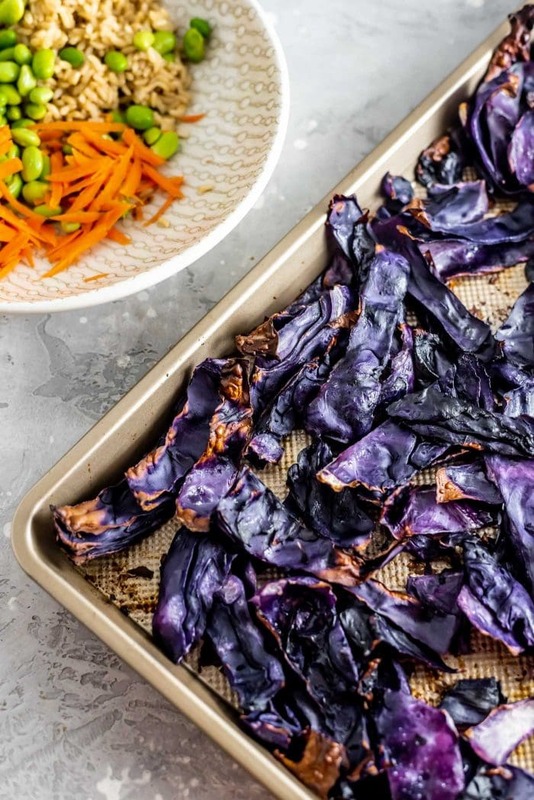 To make the roasted red cabbage, place the sliced cabbage on a large baking tray or two small ones in one layer. Sprinkle with salt and pepper and roast in the oven for 30-40 minutes until starting to brown and crisp. To make the sauce, whisk the sauce ingredients together in a jar or container or add to a jar with a lid and shake vigorously until smooth and creamy. Prepare 4 bowls or containers then divide the edamame, carrots and brown rice between them. Once the cabbage and tofu are cooked, add those as well. Finish them off with the sauce and serve right away or store in the fridge for up to 4 days. If storing leftovers, I’d suggest storing the sauce separately so the bowls stay fresher. Aww, thanks Aubrey!! I appreciate that so much. I hope you enjoy it if you give this a try! I`m a vegetarian and a tofu lover. 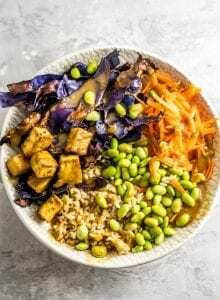 Buddha bowl-tofu edamame is a perfect meal to prep this weekend. Thanks for the great recipe. Way to go!